I rarely visit my local doctor. I treat myself, my family and sometimes my friends primarily with simple herbs that I grow myself. I’ve successfully dealt with a lot of cuts, bruises, sprains, rashes, allergies, ear aches, stomach trouble, strep throat, anxiety. depression, parasites, viral infections, chronic coughs, flu, fungal infections, nerve and muscle cramps, immunological problems, ADHD, chronic eczema and more. But there a few things I can’t handle. First on that list is surgery. When it comes to surgery I have to put on a paper nightie and surrender all control to the medical establishment. And that is definitely not my favorite thing. This meant that there was no room for experimentation or error. For the first time, my herbalist knowledge seemed completely useless. From experiences when I was younger, I already knew I don’t react well to anesthesia but the surgeon said it would be necessary. In fact, the first surgery entailed about an hour and a half of anesthesia, much longer than I’ve ever undergone before. It took me about two hours more to even become fully awake again. And then I was sorry I was. My operated eye barely hurt at all, but I was sick to my stomach and all around miserable from the toxins in the anesthesia for five days. Even ten days after the surgery, I still wobbly and easily tired, as if I was recovering from a serious illness. During the first two days all I could really stomach was salt crackers and ginger tea. In my groggy state, I was not very good at treating my own discomfort, but I did manage to remember and ask for ginger. The ginger helped and soon I could eat a bit, if I first drank a cup of very strong ginger tea. When my brain started working again, I remembered my herbalist research and specifically some studies that mentioned that ginger is used to reduce nausea and mitigate the effects of toxins in chemotherapy, surgery and radiation treatments. I wondered if ginger could help with the toxins in the anesthesia and topical antibiotics I was dealing with. However, the results of the research appeared to indicate that high doses of ginger right BEFORE toxic exposure may have much greater beneficial effects than merely consuming ginger after the fact. So, for three days before my second surgery, I consumed about eight ounces of fresh ginger per day in tea and food. And after that second surgery, the grogginess of the anesthesia was gone within an hour. I barely felt nauseated at all. I continued to drink ginger tea and be gentle to my stomach. But my energy and strength returned much more quickly, resulting in a recovery less than half as long as the first. The surgeries were successful. My world-class surgeon Petr Novak did an excellent job in a complex situation. My family and friends provided much needed physical and emotional support. In all this, And I learned a bit about how herbs can help work together with modern medicine, rather than separate from it. I have read a lot about detox treatments and natural medicinals for those undergoing chemotherapy or taking pharmaceuticals with potentially harmful side effects. Many posts and books on the subject list less than organic compounds and almost all push certain products and brand names. Some list things like colloidal silver, which while possibly a useful natural antibiotic is still a heavy metal and more likely to be part of the problem than part of the solution in this case. These are red flags for me. My approach to home medicine is based on the use of simple herbs that can be grown or found near your home. While these herbs are not without risks and I carefully note warnings or potential problems in my posts, they are herbs that have been used medicinally for thousands of years and have been proved in the ultimate test of time across many different cultures. They are also herbs that I have tried myself or seen in action. While I encourage all herbalists, whether professionals or home herbalists, to keep up on the ongoing research on herbal medicinals, there is nothing like personal experience to give a deep understanding of what an herb can do. Before I used large doses of ginger to protect myself from a known reaction to pharmaceutical toxins, I had read the optimistic-sounding research but I had little understanding of how it would actually work. I have four herbs to list that I use for detox and protection from toxins. These are all considered low-risk herbs which are consumed by many people as foods. Certainly, each individual is different and you should exercise caution with any herbal medicine and consult with your doctor, particularly if you take any regular medications. However, these herbs are among those that are usually safe and protective in action. Unlike many herbs and other detox treatments, these four can often be consumed by pregnant women and those with fragile health. Ginger acts in the body as a gentle stimulant and protector. It protects the integrity of cells and helps to flush out toxins, particularly many of those connected with pharmaceuticals. Several studies have shown that women who underwent chemotherapy for the treatment of breast cancer used ginger aromatherapy effectively to curb resulting nausea. In other chemotherapy studies ginger extracts have been found to significantly reduce post-chemo nausea. Many herbalists say holding a piece of ginger in your mouth while undergoing chemotherapy markedly reduces nausea. Another study has found similarly beneficial effects for patients experiencing nausea after surgery involving anesthesia. Radiation therapies also entail similar cell damage and exposure to toxins. Several studies have shown treatment with ginger extracts before exposure to radiation helped reduce the risks to animals (including severe radiation sickness and death) of the exposure. My own experience bears out these results. And even more exciting to me is the fact that I was able to achieve these results without having to depend on a processed ginger extract or essential oil. I was able to eat pleasant ginger curry and drink three or four cups of strong ginger tea per day (brewed by grating fresh ginger into hot water and letting it steep without boiling). The use of ginger as a simple was sufficient to significantly improve my recovery after my second surgery. Ginger has a vast array of other medicinal uses beyond detoxification and protection. Further studies and recipes for everything from coughs and migraines to cancer and Alzheimer's can be found in my home medicine post on ginger here. Red clover is a humble, almost ubiquitous plant with some surprising properties. Some studies claim it fights breast. prostate and skin cancer. Other research shows its effectiveness in mitigating the side effects of chemotherapy as well as toxic inflammation associated with cardiovascular disease. It has also been used for women's health during menopause. My only personal experience with red clover is in preventative skin care. I am at an age where it is a good idea to monitor one’s skin for strange new moles or bumps that grow instead of going away. Some years ago, I had such a mystery bump on my leg and I was considering going in for testing. But then I read about the efficacy of fresh red clover in preventing skin cancer. I thought I’d just try it out while I waited for my dermatology appointment. But when I mashed up a fresh red clover bloom and stuck it on the bump with a band aid, the effect was dramatic. This bump which had grown and itched and bugged me for months despite all the other herbal sales I tried, subsided and nearly disappeared within three days. And it stayed gone. I occasionally put another red clover bloom on it for prevention, but it has never troubled me since, though it has returned to the normal-sized mole it used to be. I can’t generalize from such a one-off personal experience. I definitely suggest you take any suspicious moles and bumps to be tested. Skin cancer is nothing to play around with. The red clover treatment also works far better in the summer when red clover is fresh and in bloom, but it’s something to keep in mind. Nettles are often considered a noxious weed and a mere annoyance. However, they have some powerful beneficial effects and are delicious steamed and seasoned with butter and lemon. Stinging nettles lose their sting when cooked, steeped or dried. The chemical compounds which cause a localized allergic reaction in many but not all people (the sting) break down when exposed to heat or UV rays. What is left is beneficial in many ways and strongly anti-allergenic. I use nettles in my home primarily as anti-allergy medicine, often with dramatic results. See my post on nettles and allergy rashes here. But there are other uses for nettles. Many herbalists use them for spring detox protocols. The usual recommendation is a cup or two of nettle tea every day for three weeks, no longer. This will flush an amazing amount of heavy metals from the body and often leave the patient feeling significantly more energetic. However, there is an important warning to go along with this. The compounds in the nettles that help to rid the body of toxins make no distinction about iron. Iron is a heavy metal and toxic in larger amounts. Nettles flush it out. If you do have too much iron in your body, this could be helpful. But some people have an iron deficiency, leading to anemia. The only time I have tried a nettle detox, it exacerbated my preexisting anemia and I was chronically tired and had to take iron supplements for weeks afterward. I don’t recommend longer nettle detoxes for anyone who struggles with anemia. I would recommend it if you are concerned that you may have been exposed short-term to toxic heavy metals and want to ensure that they don’t accumulate in your body. The action of nettle tea and nettle greens used as food to flush put heavy metals is well documented and unquestionable. It’s just a good idea to take it seriously and exercise caution. They are delicious but they are also real medicine. Dandelion has been considered a "detoxifying" or "tonic" herb for centuries. Many herbalists recommend a "spring tonic" which consists of drinking dandelion root tea (sometimes combined with nettle leaves or burdock root) for a couple of weeks in the spring to cleanse the body of the chemical residues of winter smog and mold. This can be very helpful and result in a burst of energy. The chemical reactions that make this tonic work, lead to even more startling uses. A study has found that dandelion and other herbs protect DNA against damaging toxins. Dandelion is particularly valuable in protecting the liver from toxins, including alcohol poisoning. This is why dandelion is used in drug and alcohol detox and rehabilitation. Dandelion root has also been found to combat the formation of cancerous tumors in mice and to assist in the treatment of prostate and breast cancer. Even more exciting is a study that shows dandelion to be potent in treating chemo-resistant melanoma, one of the most dangerous cancers for younger people. It may also protect against chemically induced lung injuries. In short, science is just beginning to make use of the wonderful ability of dandelion root to mitigate the harmful effects of the toxins that have proliferated in our modern environment. How fortunate that dandelions are as prolific as the dangers. 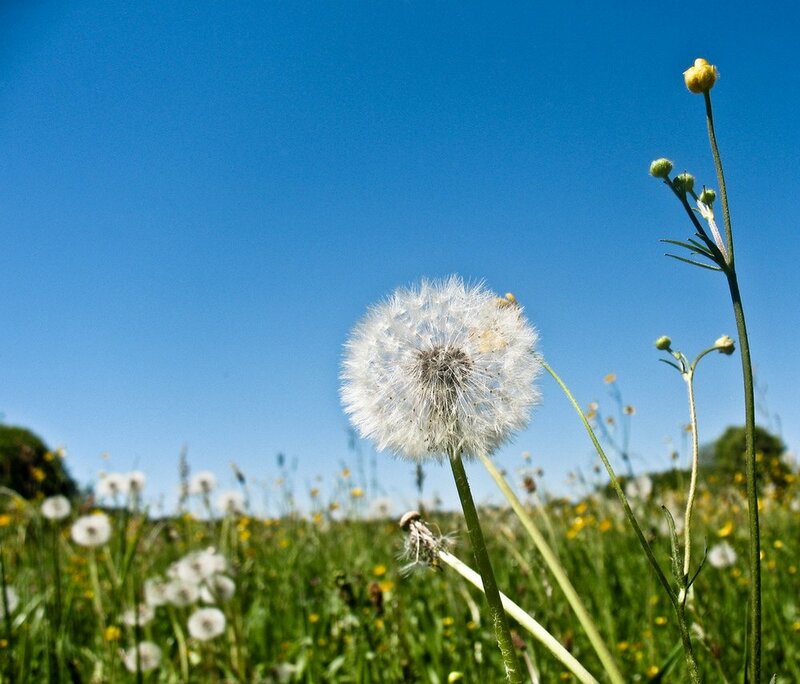 Dandelion also acts as an anti-viral, anti-microbial, anti-bacterial and anti-inflammatory agent. It can help in the treatment and prevention of a list of digestive problems including intestinal infections and chemical-induced pancreatitis. Further details about dandelions can be found in my home medicine post on the herb here. I'm going to drop the occasional herbalist-kid tip in here under the Herbalist Kids tab. Here's an ultra simple how-to from six-year-old Shaye and four-year-old Marik on how to cure a painful allergic reaction on your skin FAST! This really works and doesn't hurt at all. Instant relief if you can get it brewed quick. Here's the timeline according to the phone that took the pictures. 10:12 - Big sister Shaye swings into action, picking some of the offending nettles with a rubber glove and putting them in a cup. 10:14 - Mama puts some boiling water in the cup and Shaye stirs the nettle infusion while it steeps for a few minutes. If we had time we'd let this brew longer, but Marik's arm really hurts. 10:16 - Shaye puts a clean cloth into the hot water, takes it out and waves it in the air to cool it. You might want to let a grownup help if you are doing this while the water is still hot (like we did). 10:17 - Marik puts the cooled cloth that's wet with nettle tea on his arm. It's instant relief! The nettle burn stops stinging immediately. He's so excited that he can hardly sit still for a picture. 10:20 - The blisters are all gone. Bye bye stinging allergic reaction! Pretty good for ten-minute herbal first aid by a six-year-old! This is a simple herbalist trick that kids can do. It's good to know that nettles sting only when they're fresh. If you dry them or cook them, they lose their sting. Nettles are delicious in rice, or steamed with butter and lemon juice. Grownups sometimes drink nettle tea and it is good, but drinking a lot of it every day might not be good for kids. Before you eat a new plant or use a new herb (like nettles) for medicine, it's a good idea to try it out just a little first. Especially if you have any allergies. Try nettles by pouring boiling water over nettles the way Shaye did. Be a bit more patient and let it cool off. Then dip your finger in and take it out again. Wait a few hours. If your finger feels itchy or gets read, you might have an allergy to the good medicine in nettles as well as to their sting. If not, try washing your hands with the nettle tea. Almost no one is allergic to the good stuff in nettles, but it is a good idea to check anyway. Remember to ask a grownup before you pick or eat plants. Many plants look a lot alike and some of them can really hurt you. Plants have strong medicine and we have to be careful with it. We hope you have fun trying out our Speedy Healing Nettle Wash with Superpowers. Tell your friends about it! No one should ever have to suffer from these blisters for a long time. I would like to invite you to my hearth-side email circle. This is a small group of readers with whom I share the occasional virtual cup of tea and links to my latest posts. To add to the fun, everyone who joins my hearth-side email circle these days gets a free ebook (for teens and adults, not for young kids) in Kindle, Epub or PDF format. You can have either The Soul and the Seed (Book 1 of The Kyrennei Series) or one of the later books in the series. It’s your choice. My six-year-old daughter and I went out searching for the earliest herbs on a sunny morning last week. There isn't much growing in our area yet and we were hoping to find chickweed. Instead, my daughter found nettles - the hard way. Young nettles can be potent and these stung her right through her pants when she knelt in the grass. Different people have different levels of allergic reaction to nettle stings. My husband is almost immune to both nettles and mosquitoes. He isn't just tough. His skin doesn't react to the irritants. His whole family is like that, possibly because their ancestors lived in a swamp for hundreds of years. My daughter and I are not so fortunate. Within a few minutes her knee swelled up with painful pustules. I often just grit my teeth and ignore it when I'm stung by nettles, but I made the snap decision to teach my daughter a valuable lesson about herbs. There are very few herbal medicines that act as quickly and dramatically as nettle anti-allergy medicine. It is handy that they are their own antidote. I used a piece of paper from our field notebook to protect my fingers while I picked a few sprigs of nettle, while I explained that we really didn't mean to disturb them and thanked the plants for their help. Then I took my crying child home and quickly boiled some water. I poured the still-bubbling liquid over the nettles and let them steep in a cup. This is one of the few instances where you want fresh boiling water with herbs. Many herbal infusions or teas are better made with slightly cooled water. But the boiling water breaks down the chemical compounds in the nettle that cause allergies and leave the antidote behind. You might not believe me. My daughter didn't. She was a little afraid when I dipped a clean cloth in the nettle tea. Nettles hurt after all. That was her first plant lesson ever at the age of eighteen months. I waved the cloth in the air to cool it and then pressed it onto her knee. Within a second her eyes widened with surprise. The sting was gone. This works with strong nettle tea, steamed nettle or infused nettle oil and it only takes a second or two. The cooling, soothing action of the herb is so demonstrative that it's easy for a child to observe. When I began learning about herbs, I held the common assumptions that herbs are natural and gentle medicine, good for prevention and a little remediation of symptoms if you're willing to wait. With the diluted and over-processed herbal products I'd bought I had become used to the notion that herbs are medicinally weak and always take longer to relieve symptoms than pharmaceuticals. Nettles were one of the first herbs to teach me the shocking truth. I was enjoying a sunny spring day with a friend. She had two daughters ages five and two. The younger child was adopted. We sat on my veranda sipping iced tea and watching as the kids raided my strawberry patch. "Oh, I do hope she really isn't allergic to strawberries," my friend said, referring to her youngest child. I asked her what she meant. As an adoptive parent, I know the anxiety about allergies. Without the genetic continuity within a family, it is more likely that unexpected allergies may crop up. My friend explained that her two-year-old had developed a severe rash after eating strawberry jam and that she had never had fresh strawberries before. We returned to our conversation but ten minutes later the children came running. Sure enough the two-year-old was covered with the worst skin condition I have ever seen. Her body was covered with bubbles the size of quarters. Some sort of liquid seemed to be inside the bubbles. I had never seen a person's body change so quickly and I was afraid. The child looked like she might have general swelling, like a life-threatening allergic reaction. She was crying and scratching her skin hard enough to draw blood. And all the while I knew that my friend has a psychiatric condition which can result in anxiety attacks that make it impossible for her to drive. I assumed that we would need to go to the emergency room and I can't drive, because I'm legally blind. Both of our husbands were gone and my friend was the only available driver. I was desperate to keep my friend calm. I had read someplace that infused nettle oil could be used to treat allergic reactions on the skin and I had just such oil (a little experiment I planned to try out on my own nettle stings) freshly brewed in my refrigerator. I went and got the jar of oil and told my friend to smear it all over the child. I doubted it would help enough to matter, but it would give the mother something to do and it might sooth the child a little. Then I grabbed my phone and ran into the other room to call a friend with medical experience. I quickly got the information that a strawberry allergy was very unlikely to be life threatening. I relaxed a little and described the child's condition and wrote down a list of heavy-duty anti-allergy medications we would need from the pharmacy. My friend with the medical background sounded discouraged. She said the child and her mother were in for a very bad night. It would usually take about twenty-four hours for the anti-allergy medicines to really take effect and the itching was going to continue to be very bad. I could tell that our fun day in the spring sunshine was over. After I got off the phone I went back out to see my friend with the little girl. About ten minutes had passed and I thought I must be imagining things. The huge bubbles that had been on the child's skin had been reduced to small white bumps. And while her mother continued to apply the nettle salve the bumps disappeared entirely over the next twenty minutes, leaving nothing but the bloody scratches left by the child's fingernails. Both the mother and I were hugely relieved and amazed. I'm glad that my first reflex was to help the suffering child, but I do wish I had somehow managed to take a picture of the condition because the change was so dramatic that my friend and I both found it hard to believe that what we had seen was real. We did go to the pharmacy and she picked up the anti-allergy medicine to be on the safe side. But I also sent her home with a jar of the nettle oil. My friend reported that the rash did come back about twelve hours later and she put more of the nettle oil on it and it receded again. I have tried nettle oil on other skin conditions and sometimes it works and sometimes it doesn't. I can only conclude that it works for certain types of allergic reactions and when it works it works very well. As soon as there are enough nettles, I'll make some more this spring. The broader lesson to be learned here about herbs is that herbs are not necessarily slow-acting or less powerful than pharmaceuticals. We have no good controlled trial of nettle oil versus pharmaceutical anti-allergy medicines. I hope there will be one someday. But in this case the nettle oil was at least far better than the standard prediction of how the anti-allergy medicine would work. It is worth noting that strawberries are plants too and there is another lesson to be learned from this incident. As quickly as herbal medicinals can help, some herbs can cause toxic and allergic reactions just as swiftly. This is why it's important to treat herbal medicinals with respect and caution. In their fresh forms, many herbs are extraordinarily potent. And not everyone has the same reaction to each one, just as not everyone is allergic to strawberries or to uncooked nettles. For quick anti-allergy medicine, pick several handfuls of nettles using hand protection of some sort. If possible, chop the nettles up. Put them in a cup and pour freshly boiling water over them. Just cover the nettles with water. Stir well and let the infusion steep for ten minutes. You can dip a cloth into the liquid and then wave it in the air to cool it more quickly. You might be able to use dried nettles for the infusion but the effect might be less dramatic. This is the fastest way to make anti-allergy medicine from nettles but it still takes awhile. During the spring gardening season when our yard is surrounded by nettles and bees, I like to keep a jar of nettle infusion in the refrigerator all the time. Then when I'm stung, all I have to do is pour nettle tea over the affected area. The relief is immediate with nettle stings. It is also good for mosquito bites, bee stings and other bites that cause an allergic reaction. For an anti-allergy medicine that will sink into the skin, possibly producing a deeper and longer lasting effect, I make infused nettle oil. The process is the same as for any infused oil, except that it has to be done using fresh nettles, which means most people will have to wear gloves. Pick a basket of nettles and chop them into half-inch sized pieces. Put a loose lid on the jar and set it in a window where it gets as much full sunlight as possible. Check the jar the next day and add oil. It will tend to settle and all the leaves must be covered by oil to avoid mold. Check every day until the leaves stay covered. Leave the infusion in the sun for at least two weeks. Then strain the nettle leaves out. (Use cheese cloth and wring them out to get the last of the oil.) Store infused nettle oil in the refrigerator. I will post later on how to make a salve out of infused oils. This can be done with nettle oil as well. My children love risotto, which is essentially rice fried on butter and then cooked with vegetables and sprinkled with Parmesan cheese. Adding nettles to your food in the early spring is a great way to get some greens before your garden has a chance to produce any. Beyond that nettle tea and nettles in food help the body rid its self of toxins and heavy metals. To make simple nettle risotto, heat a few tablespoons of butter in the bottom of a pan, add a chopped onion, a few cloves of chopped garlic, a chopped red pepper and a little frozen corn or peas. Fry very slowly for 15 minutes without letting it burn. When the vegetables have softened, add two cups of rice and turn up the heat. The rice will begin to lightly fry, so keep stirring it. After a minute it will look slightly translucent. At this point you can add a dash of wine if you want. Keep stirring for another minute. Add 4 cups of hot water. Add a teaspoon of salt and some black pepper. Turn down the heat and let the rice cook. Taste the rice after about 15 minutes and add more hot water if necessary. In a separate pan boil two cups of chopped nettles for five minutes. Pour off the water into a jar and save it for anti-allergy wash in the refrigerator. When the rice is done, mix the chopped nettles into your risotto. Add some butter and Parmesan. Some herbalists use nettles as part of a seasonal cleanse meant to clear out toxins and heavy metals after the winter months. I recommend doing this only with the supervision of a professional herbalist or doctor because I have seen nettle cleanses appear to cause anemia. It is possible that nettles tend to help remove iron from the body, just as they remove other heavy metals. Whether or not that is the problem, I suggest eating nettles only once or twice a week unless you are doing a monitored cleanse. Please note that this post doesn't constitute medical advice from a doctor. You should consult a doctor with health problems, such as allergies, in order to make informed decisions. If you like my posts about herbs, you are also invited to join my hearth-side email circle. I will let you know when the next installment of the Home Medicine Cycle is posted, so you can keep up and use it as a tool as you take back your health. By subscribing, you join an intimate circle of my readers who enjoy the occasional virtual cup of tea and links to my latest writings. This is my well-protected, spam-free corner of the internet, so that's all you'll get. Welcome to my fire.